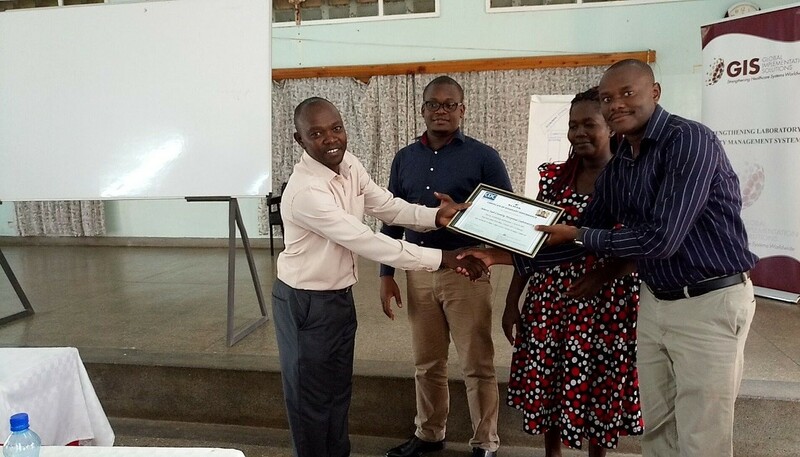 The journey toward success began when 10 labs under GIS mentorship were selected from the 29 labs undergoing accreditation mentorship. The criteria being county representation and the immediate accreditation rapid results initiative baseline internal audit performance. The County management, respective laboratory management and other partners supporting them were taken through a sensitization process detailing their roles and expectations leading to a development of a roadmap and detailed plan on what each party will play to ensure that the labs achieve RRI accreditation at the end of mentorship. Based on the baseline RRI internal audit report, comprehensive work plans for each of the 10 labs were developed. This was done by the resident mentor and the entire lab, ensuring that all of the laboratory staff were assigned his/her responsibilities. GIS management, respective mentors from the 10 labs and other GIS QMS mentors from labs not involved in RRI accreditation mentorship held a planning meeting in which mentors were identified based on their expertise and put into 2 groups each headed by a coordinator. The 10 labs were equitably assigned to the two groups, earlier developed lab specific work plans and reporting tools were also given to the two groups. The management committee remained pivotal in resource mobilization coordination and supervision. Each group was tasked to share weekly report with management committee detailing progress made, challenges encountered and how they were surmounted and those that require management intervention which in turn relayed the same to CDC for purposes of monitoring, direction and support. Synergistic approach, owing to putting together 3-4 mentors, worked well within a very short time since varied expertise, experience, approach worked by reducing time spent by a single mentor who is likely to take more time due to challenges ranging from his/her approach to expertise. 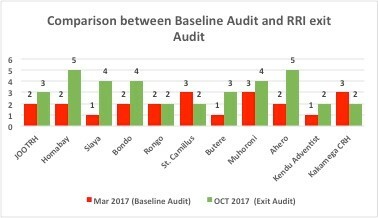 At RRI exit results were remarkable as shown in the graph below and as a result 7 labs are now undergoing preparation for KENAS audit.